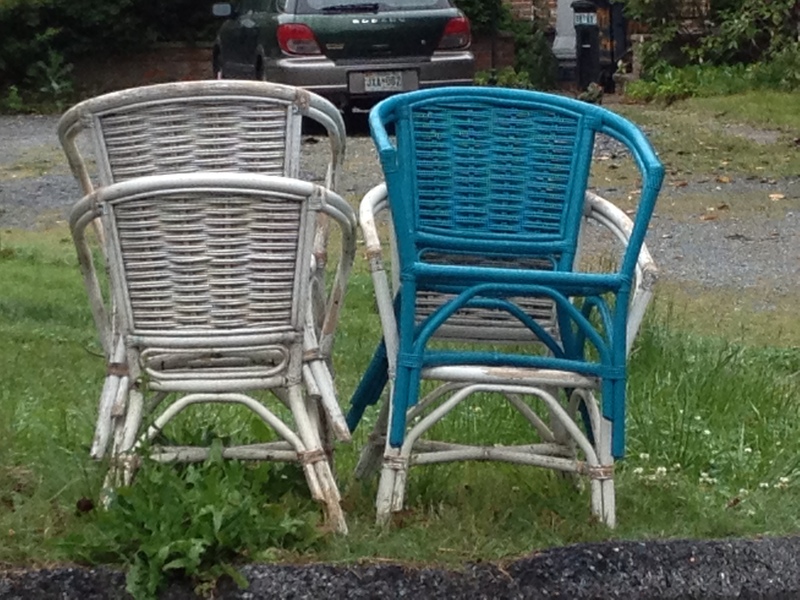 Here is a picture of my chairs. 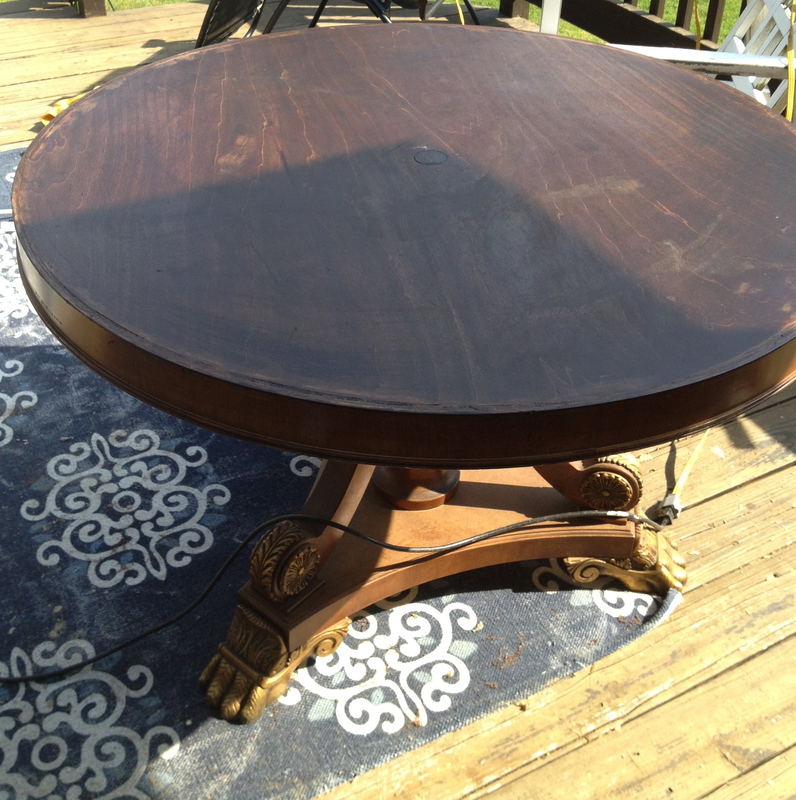 Glorious finds from the trash, only to end up back on the curb. I ordered fabric to cover the seats, bought a nearly-reportable amount of spray paint, and sadly, they are right back where they came from. The chairs that were not meant to be. I was sanding chair #2 when the front leg snapped off. I have invested emotionally in these trash chairs and find that I want to go spend a ridiculous amount of money on new chairs to recover from this loss. Does BlueCross BlueShield cover retail therapy? 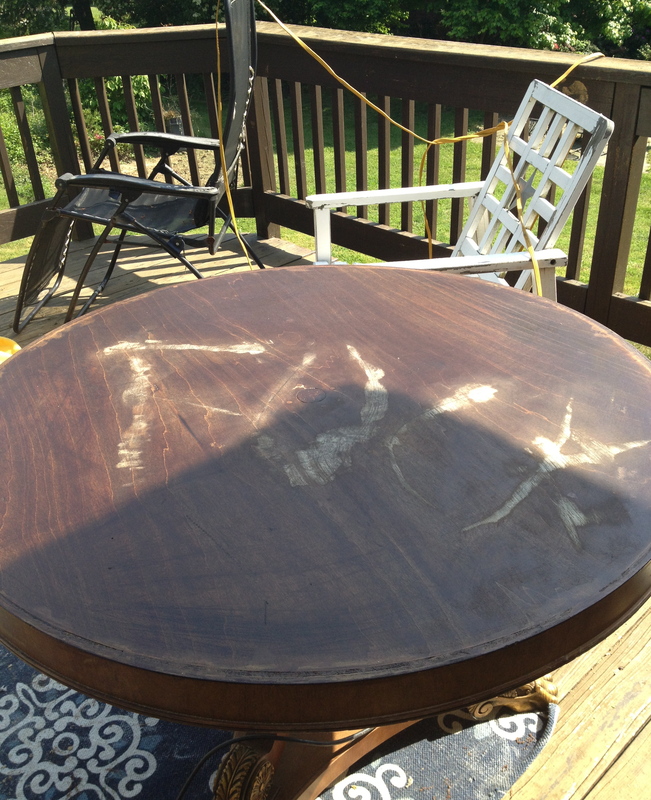 The table, another trash find, is another sad story. I was in such a state of euphoria when I saw it by the dumpster, that I failed to notice the text that was carefully etched into the top. Look closely at the table. “SH**!” I said, “I mean, ‘NO WAY!’ Who would do such a thing?” and then I apologized for exposing my children to more profanity, intentionally or otherwise. You know how you worry about what your kids will be exposed to at a friend’s house on the Internet? Well at my house, it’s the graffiti you have to worry about. Trying to fix it with wood putty. And we were once again fit for polite company. 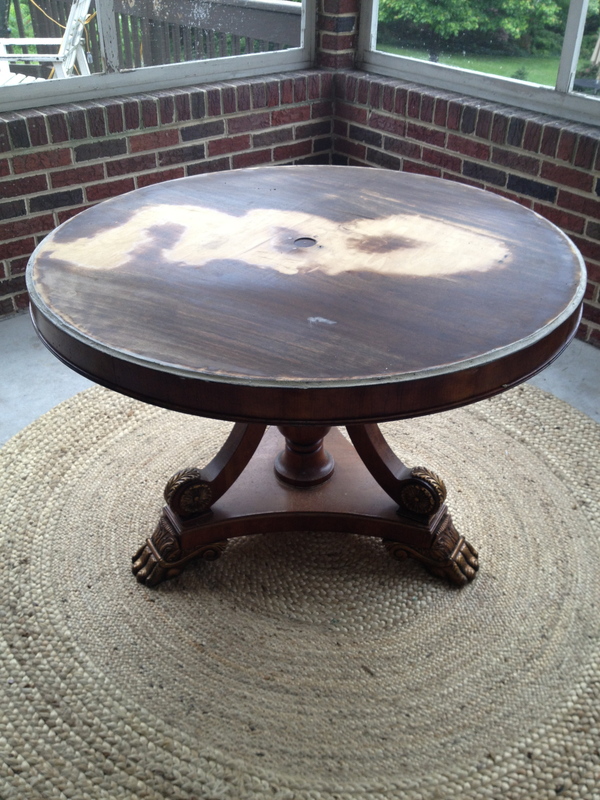 But alas, it has been sanded too much, and I am going to put it back on the curb. It is a sad day indeed. Now, I have a porch that needs paint, a new light fixture, AND furniture. But the rug looks nice! However, I am back to the drawing board. Good thing there is an awesome barrel in the basement, just waiting to be the base of my new table. Recently, I was shocked to discover that you need ID to buy spray paint. Naturally, after purchasing the illicit spray paint, I started to think what else (besides my planned project) could I do with it? What actions would justify needing to show ID to buy spray paint? The temptation to casually spray paint a plant as I was leaving Home Depot was great. Fortunately, I remembered in the knick of time, that I had just flashed them my ID and refrained. 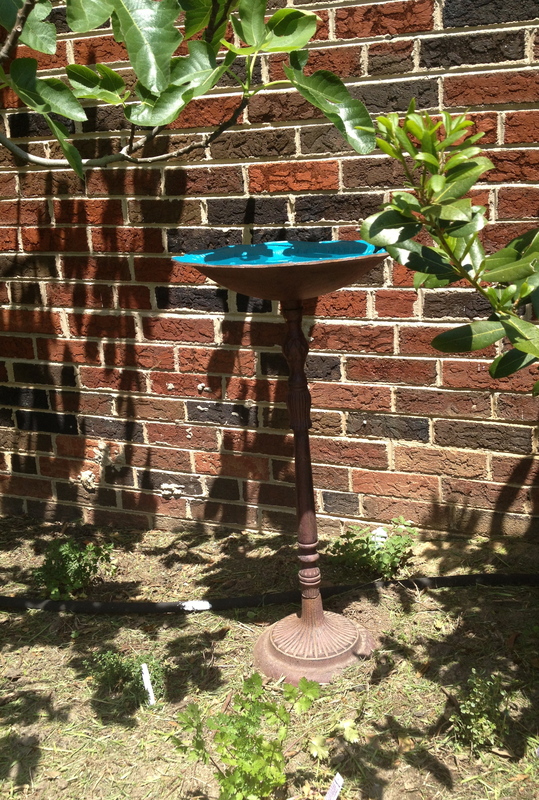 Now the wheels were turning and I decided to spruce up a rusty old birdbath that was hanging out in the Fig Tree garden. I sanded and wiped out the inside of the bowl and thoroughly dried it. 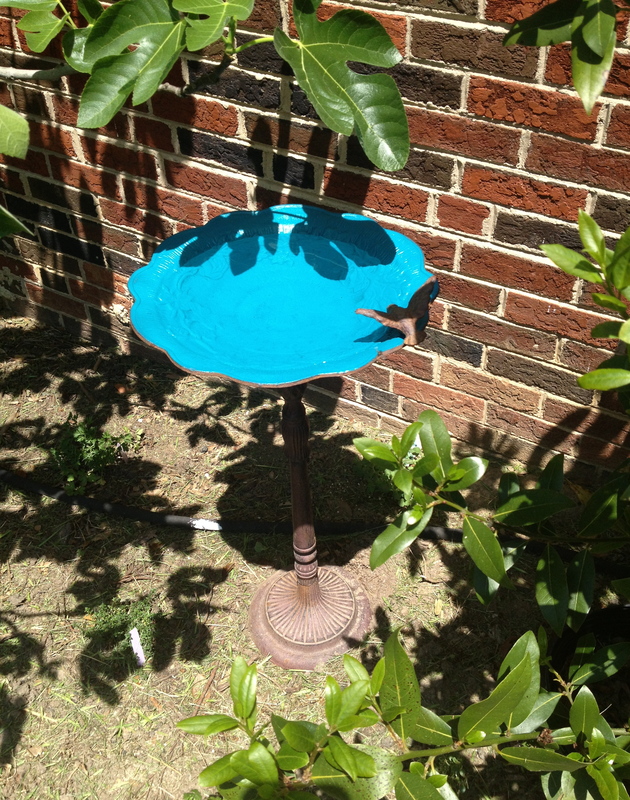 I removed the little bird on the edge, so it did not get painted and would remain the rusty-brown color of the base. 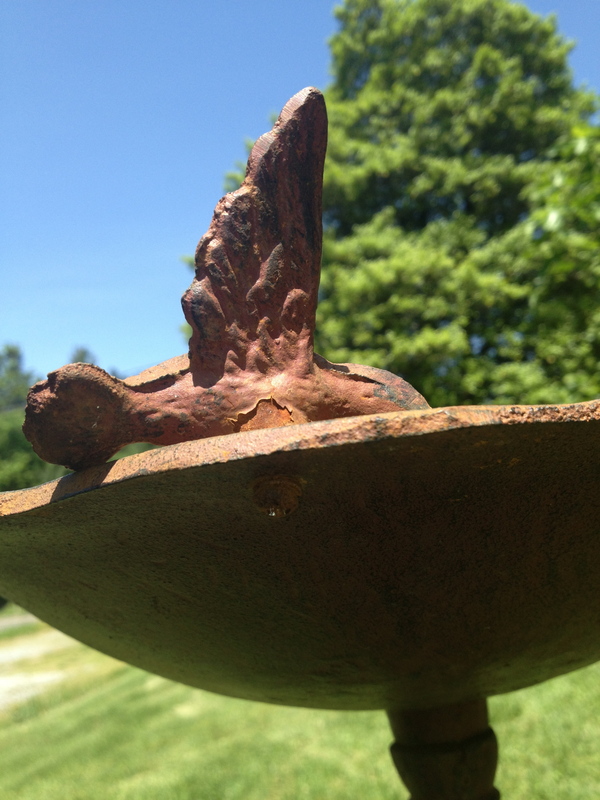 Removing the little rusty bird. 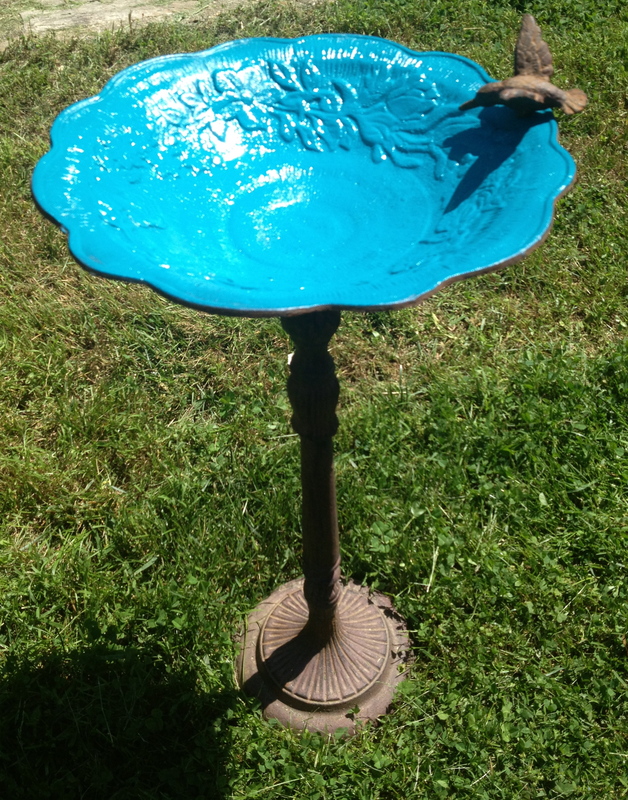 Then I sprayed the bowl with turquoise colored spray paint called Lagoon for wood, plastic or metal finishes. I did this while wearing the best graffiti-artist look I could muster. The new color reminds me of the bottom of a fountain. 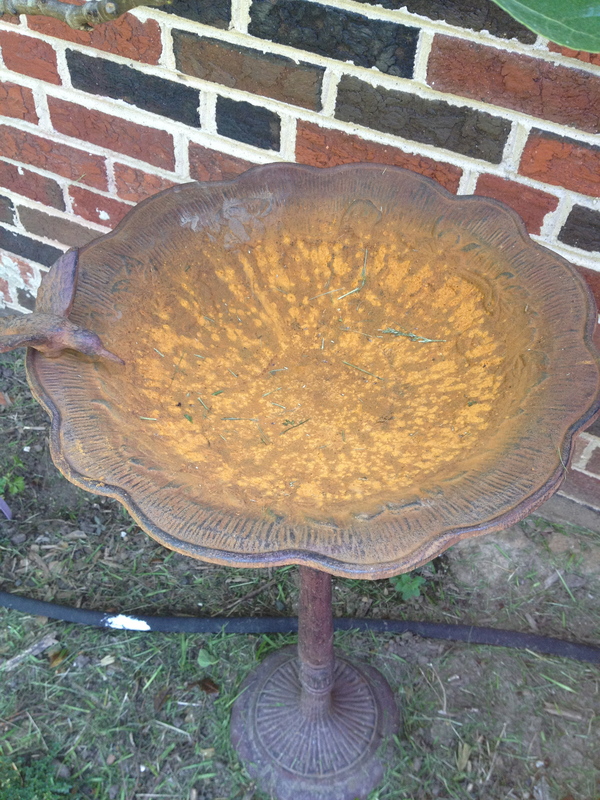 It will keep the water looking nice, instead of the rusty, dirty-brown color the water was before. Back in the Fig-Tree garden. This was a fun and easy way to add a pop of color to the garden. Now the birds can bathe after they feast on the figs from my tree. Of course, I can’t stop thinking about spray paint either. This could be dangerous, and may lead to some sort of Spray-Paint Graffiti-Sniffing Moms Anonymous Club, coming soon to a location near you. 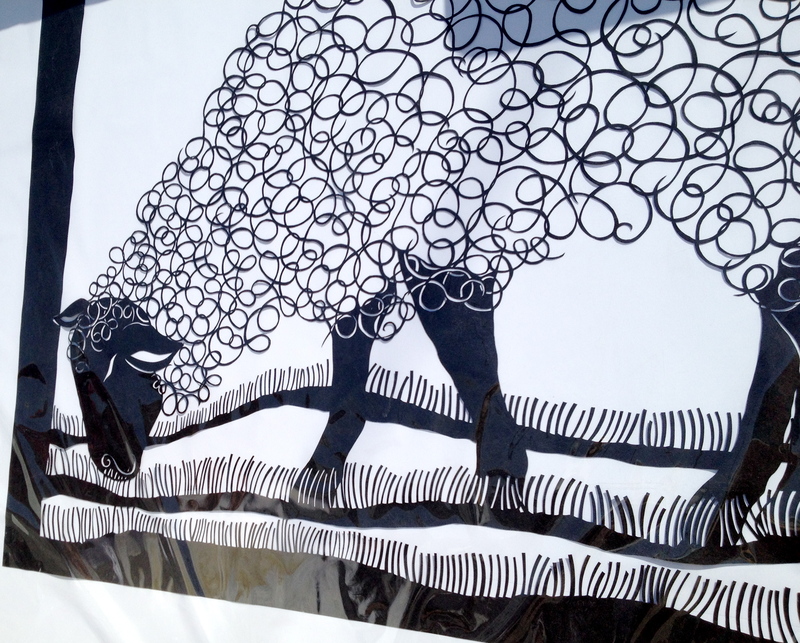 The Maryland Sheep & Wool Festival is magical. 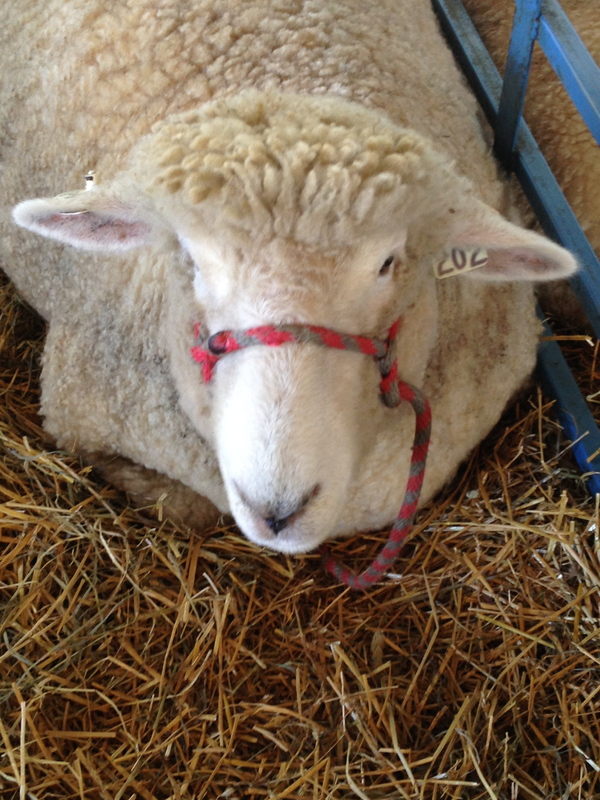 For a mere three hours this past weekend, I attended the 40th annual Maryland Sheep & Wool Festival. Once again, I was struck by the beauty of my surroundings. 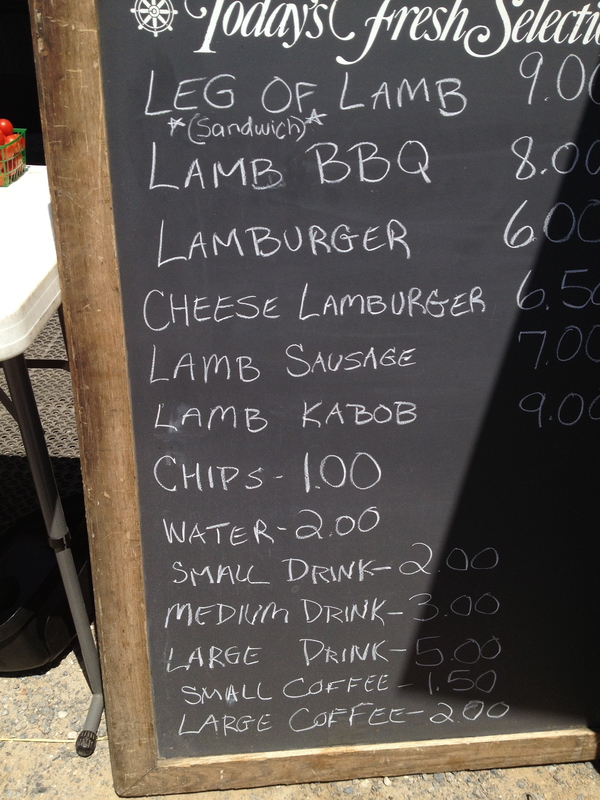 My senses were assaulted with the smells of lamb and funnel cake. The natural fibers and brightly colored dyes mix together in seeming harmony, and the craftsmanship is brilliant. This year we were on a mission to buy a spinning wheel. We did buy it, and I fully expect to be fined by OSHA, for opening some sort of sweatshop here under my roof. Prima will beg Stuart to put together her new wheel and spin until there is nothing left to spin. Once again, I am amazed at this child, who seems to have been born into the wrong era. 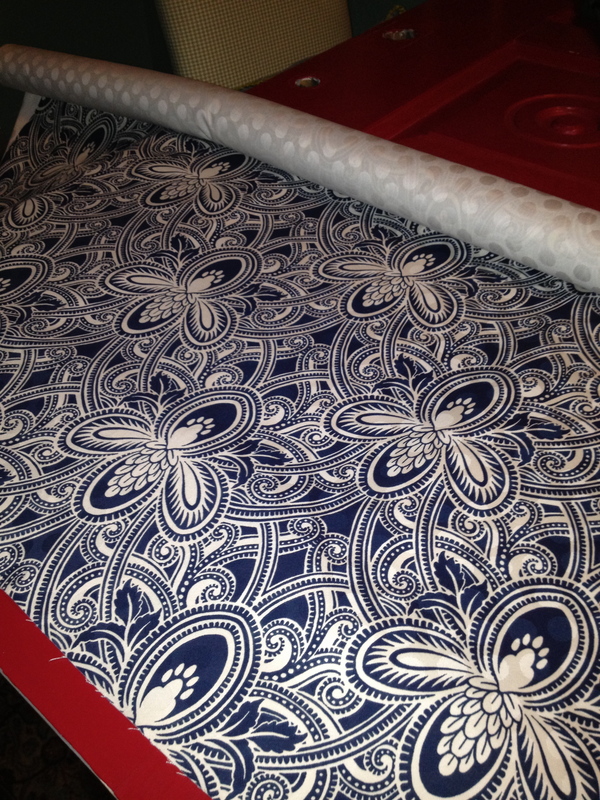 I did indulge in one … little … extravagance… in addition to the new spinning wheel. I am in love. 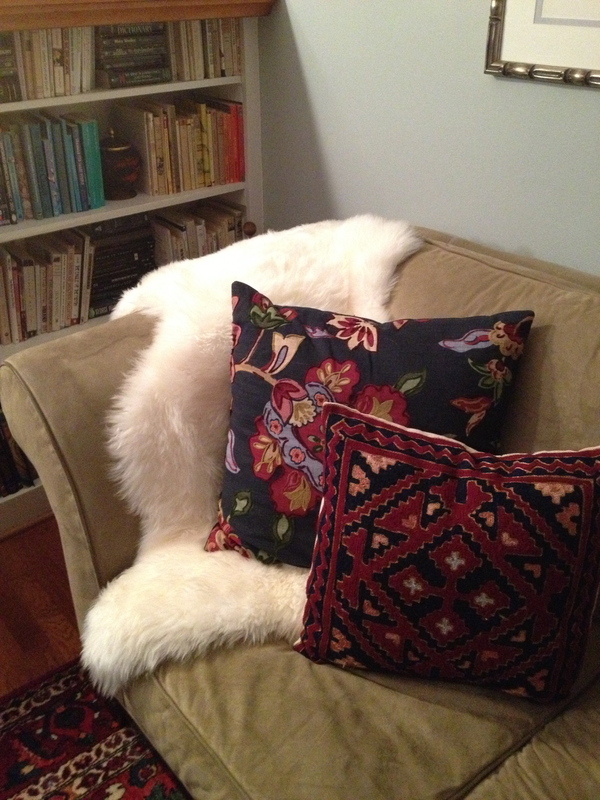 A sheepskin so white and soft, so thick and creamy, I could not let it stay behind. It needed a home and my sofa was it. 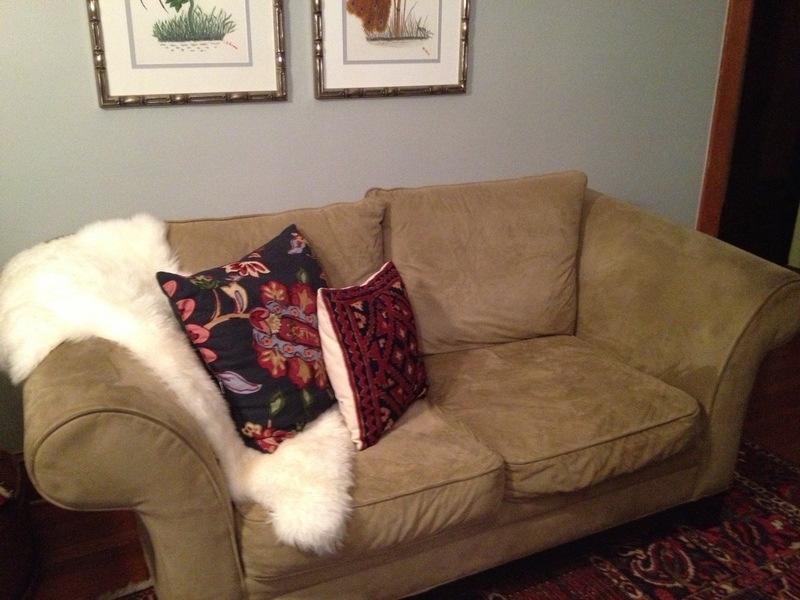 My tired, ten-year-old sofas got a little face-lift. This fleece is so soft, I can’t help but pet it. My dog is going to be jealous, or maybe even my husband. I love to connect the things I own to an experience, a person, a place, or a moment in time. This sheepskin will be tied to the memory of a beautiful day, spent with my children, at the 40th annual Sheep & Wool Festival. Consider putting this Festival on your bucket list. You will not regret it.